The Literature Sorter is ideal for desktop storage, keeping frequently used papers readily to hand. Suitable for use in any office or classroom. 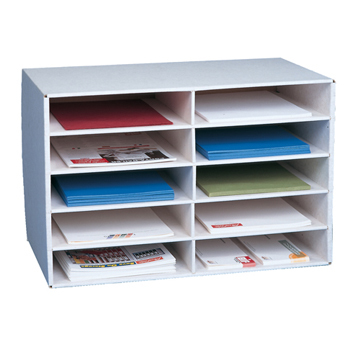 Holds A4 or Foolscap papers and documents in 10 pigeon holes. Each pigeon hole measures H65xW275xD330mm. The Literature Sorter can be stacked up to 4 tiers high and is flat packed for easy storage. Made from tough corrugated fibreboard. H385 x W585 x D330mm.